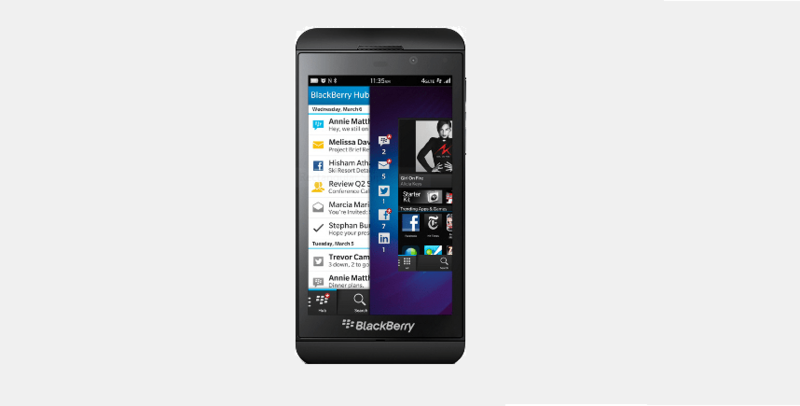 BlackBerry launch first BlackBerry 10 Operating system based cell phone name Blackberry Z10. BlackBerry10 have Hub feature which brings emails, texts and notifications at same place and accessed by swiping up and then to the right from any app. BlackBerry also have a new touchscreen Keyboard which reduces the effort on typing by suggesting words on typing which makes help to type faster, more accurately. BlackBerry Z10 have 8MP Camera which takes good quality pictures with time shift mode, You can shoot HD video. The camera has LED flash. Display of BlackBerry Z10 is 4.2 inch in size and has resolution of 1,280×768 which increases the experience of viewing videos and photos. The phone support 3G network and 4G LTE, which increase the browsing experience. And for the connectivity the phone have Wi-Fi (802.11 a/b/g/n), Bluetooth 4.0, NFC, Micro-HDMI port and Micro-USB port. The phone has lots of apps for social sharing, apps for music, Maps, and documents viewer etc. The phone is preloaded data 16 GB internal storage and has a micro SD slot for expanding the memory. Standby time of the phone is 13 days and up to 10 hours talk time.